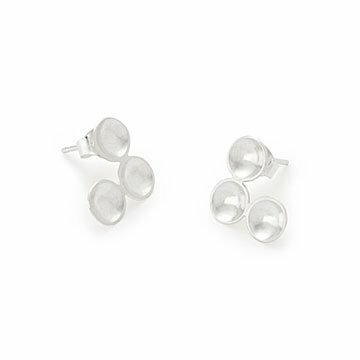 Carol Joannidi's simple studs can be worn up as a climber or down as a dangle. In the mood for a contemporary climber? Or maybe you'd prefer an eye-catching dangle. With a simple twist, these silver studs offer both options. Carol Joannidi fashions recycled North American sterling silver into a cascade of bubbles that wink at Bollywood style. These versatile studs will quickly become an everyday favorite. Backings included. Handmade in Holyoke, Massachusetts. Carol Joannidi was raised on Martha’s Vineyard surrounded by educators, artists, cooks, storytellers, and other creative people. Classically trained in metalsmithing at the School of the Museum of Fine Arts, Boston, Carol strives to create lightweight but durable designs that are timelessly modern. All work is hand fabricated using traditional metalsmithing techniques and recycled North American metal. She also incorporates stone setting and resin casting of native elements into the work. Her designs draw from nature, math/science, and her surroundings. Carol currently resides in the wilds of Western Massachusetts. Read more about Carol in a Q&A with her on our blog. Use polishing cloth for touch up.